We were stuck for more than 24 hours in Salt Lake City. We abandoned the Public Works truck at Transmission Man. We are now in a rented 2014 Dodge RAM 2500 which does not even seem like it came from the same planet as my 1990 Ford F250. 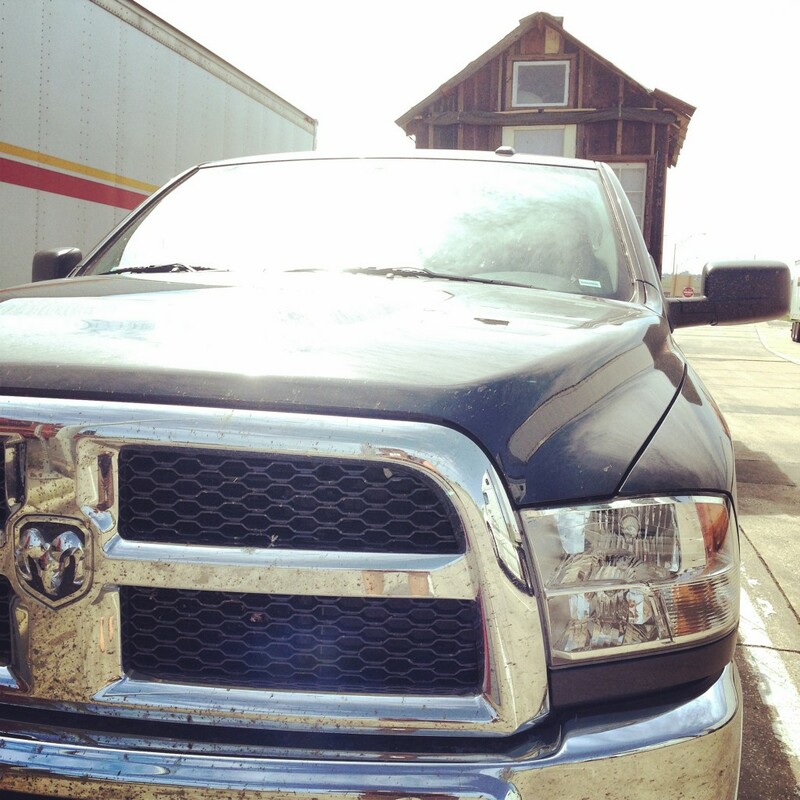 With a decent truck you can travel near the speed limit. Even towing a trailer. Even going up hills. Is it too late to give up my poor artist’s life? The steepest ascents up the Rockies on Highway 80 are the ones just east of Salt Lake City (the ones that killed the first truck). The more impressive summits 5000 feet higher up the mountain are gentle as kittens by comparison. When you see a thousand head of cattle out on the wide expanse of the high desert at the top of the Great Divide, distances and relative sizes are hard to judge. It looks like the cows receding into the distance are just progressively smaller cows and then black sheep and then maybe black chickens standing around in clusters. When we entered Wyoming, the department of game and fish wanted to inspect our boat. We told them it had never been in the water and that we were just passing through Wyoming anyway. They liked our boat. Kai thought “Game and Fish” sounded like a booth on the carnival midway. 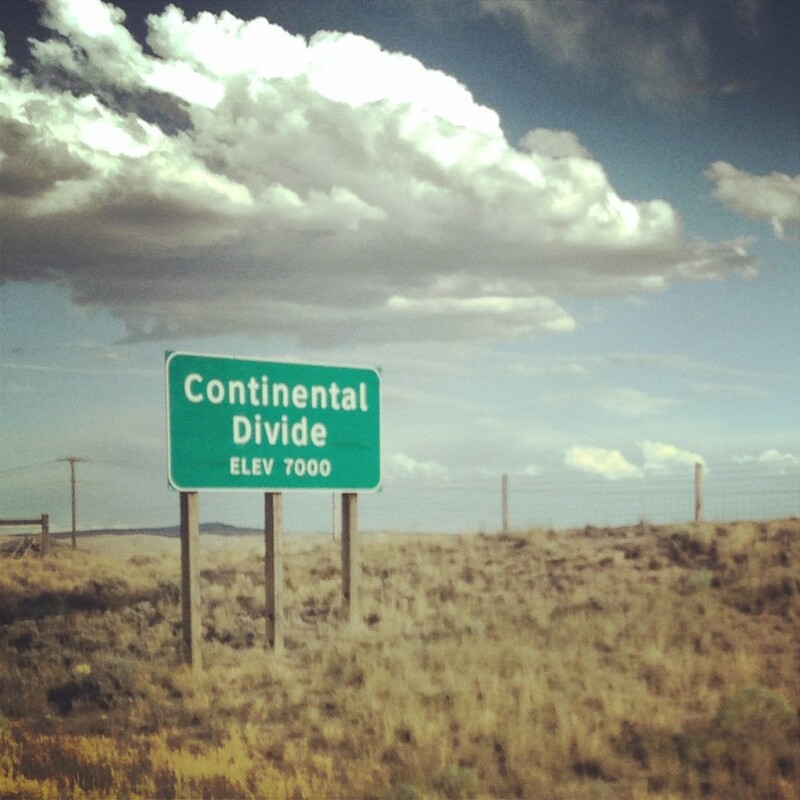 We crossed the Continental Divide twice with neither of us doubling back. Want some geology geek-out trivia fun? Google Great Divide Basin. When we rented the new truck, it needed a new electrical trailer connection. Of course. Of course it did. So I needed to replace the trailer plug again. The consolation was that the new truck had a fully integrated trailer breaking system. It issued little reports along with all the new-fangled status information on the dashboard control panel: trailer break gain, fuel efficiency, coolant temperature, oil temperature, individual tire pressure. 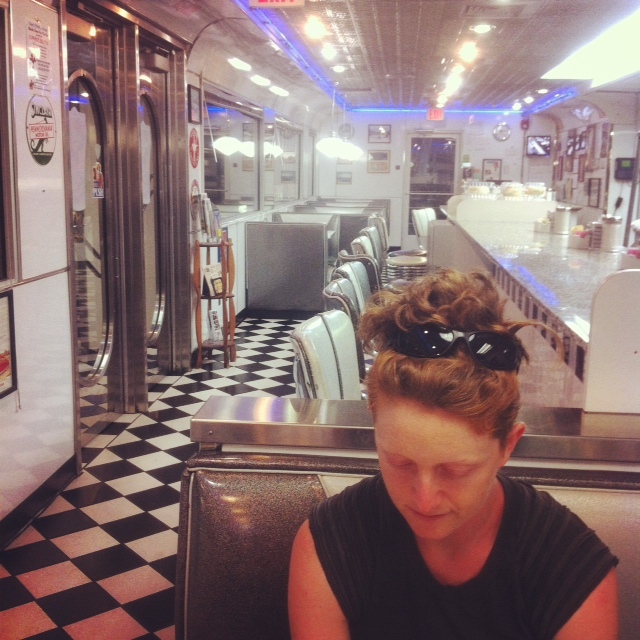 Penny’s Diner in Cheyenne, Wyoming is cheap and decent and looks like a 50s diner. 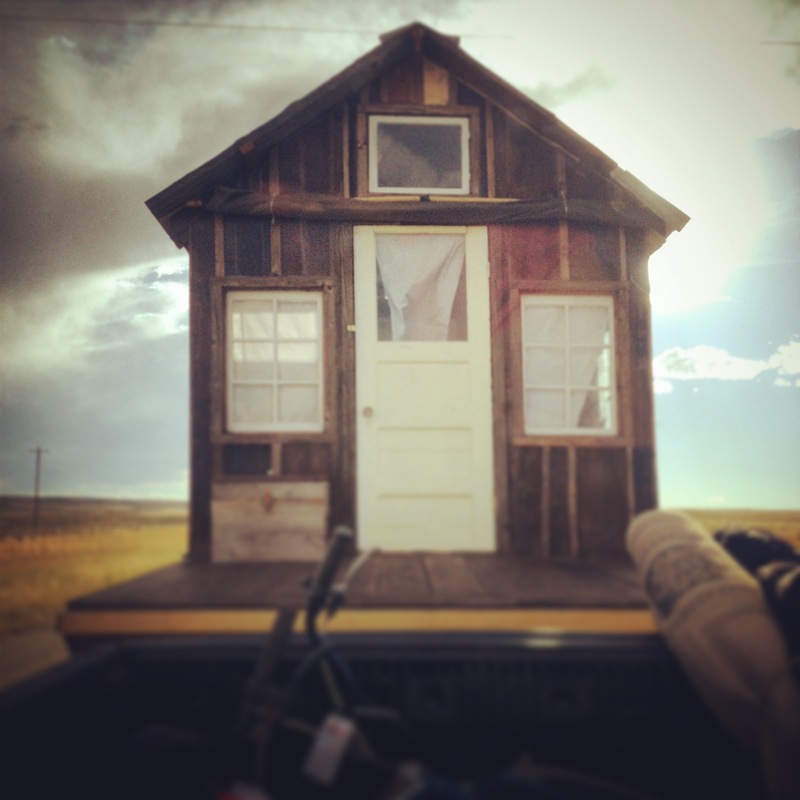 Oh and the trailer brakes kept going out on the way down the Rockies and across the prairie. It wasn’t my plug, and it wasn’t my earlier splice. It is likely something in the many many layers of wiring and re-wiring we’ve done stopped on various roadsides through the years. Note to self: Rewire the trailer in a free moment. Actually everyone liked our boat. 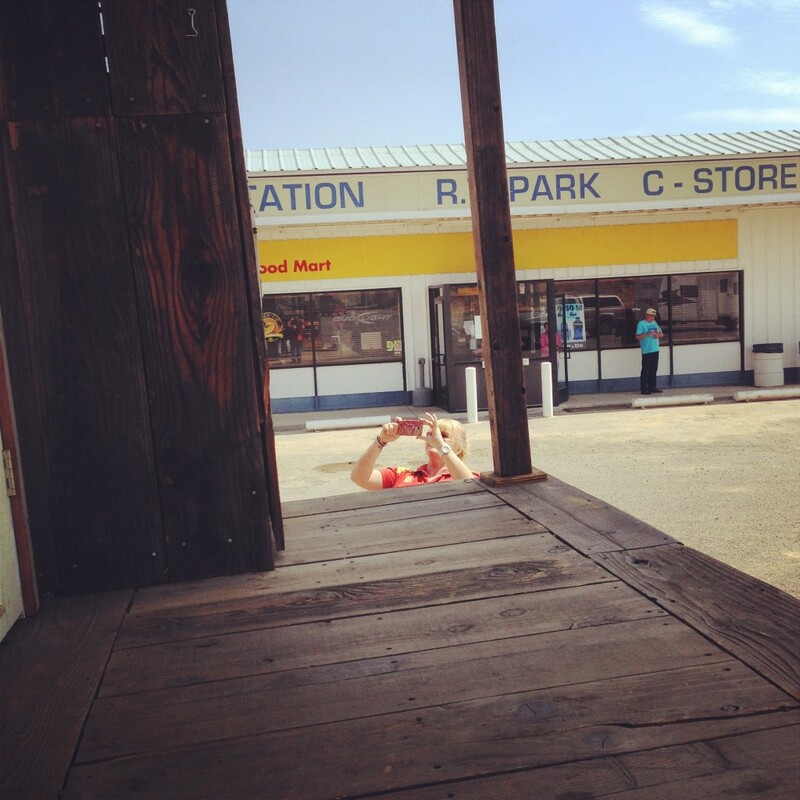 We got discounts at truckstops just because of the shantyboat. People everywhere asked us about it. People are surprisingly polite about taking pictures. With few exceptions people asked, “May I take a picture of your boat?” Apparently America’s mamas raised you right. 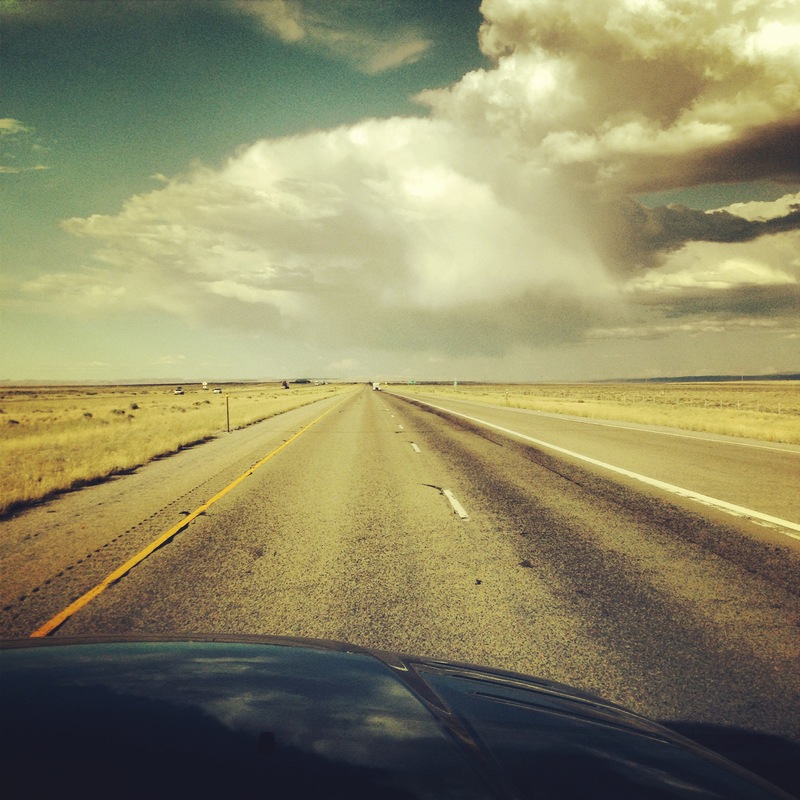 If you a) have a vehicle that can go the speed limit, b) keep driving, stopping only to put fuel in the truck and quick food in your face, and c) stay up all night, driving in shifts, you make steady progress and get across country quickly. If you look at one of the trailer wheels and it looks a little funny and lopsided, it might be the lug nuts. Tightening these may keep the trailer wheel from falling off in a Nebraska truckstop. Not that this has ever happened to us. 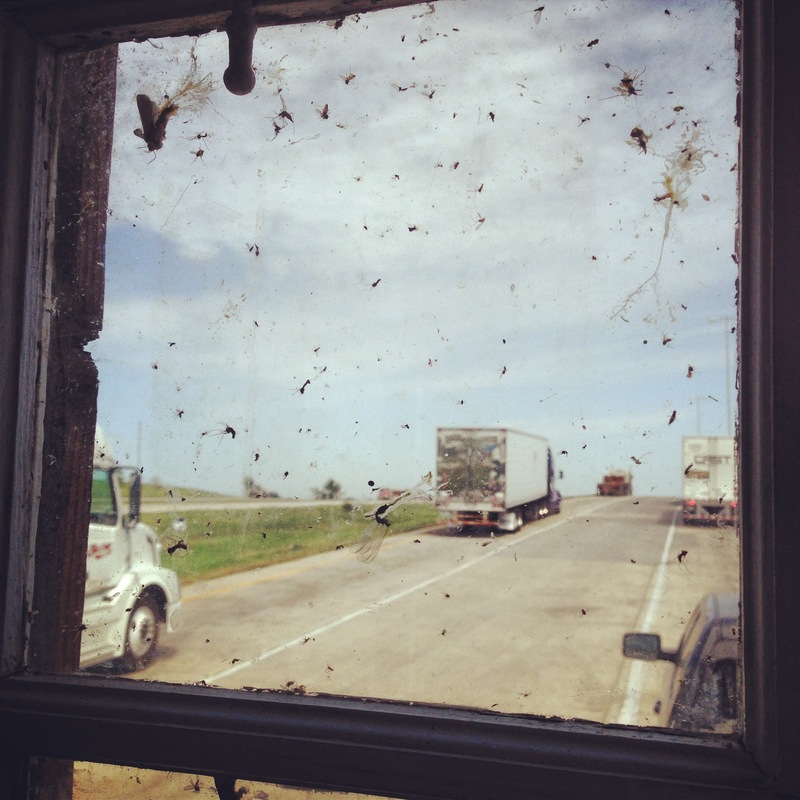 When we arrived in Omaha after a full night of driving, the truck and the shantyboat are entirely blanketed in the remains of an insect massacre. We have expanded the project to include the Entomology of the Western Prairie. Copyright © 2019 A Secret History of American River People. All Rights Reserved. You have a story? We’d love to hear it. Contribute your river story and photos here. while we journey to and explore the Ohio River! Help! We need your support! We are currently preparing for a summer of fieldwork on the river and need all the help we can get. Please donate to our spring fundraiser. We are currently doing a summer of fieldwork on the river and need all the help we can get. Please donate to the project. We just completed a summer of fieldwork on the river. Please consider a donation to the project.